Watch our new video that has updated information and full instructions on making Georgie Meatloaf. This is a 30-minute program, be sure to watch the entire video and make notes if necessary or come back and watch it again as you prepare your own Georgie Meatloaf. or years I searched for the healthiest food for my Georgie and was ready to give up. I wasn’t happy with commercial dog food and decided to develop my own recipe after doing extensive research and came up with one of the best recipes for healthy and safe dog food that we call Georgie Meatloaf. As you read this article you will see this is a supplement to our Georgie Meatloaf video on YouTube, now over 320,000 views. Georgie is now 11 years old and is 75% Chihuahua and 25% Spaniel mix according to a DNA test we ran. He is the smartest and sweetest little guy and everyone stops to talk to him, pet him and ask about him. I have found that Georgie has actually helped me and my wife meet new people and make new friends. We began to socialize him when he was very young and I take him with me to as many stores as I can. Usually in the shopping cart and Home Depot, Lowes or Kohl’s and in his nice bag that I put over my shoulder for stores like Old Navy, Marshall’s and others. Since I am a photographer, I have taken many photos of Georgie and his friends and put up a nice little fan page for him on Facebook. You can LIKE Georgie by visiting his page “I Love Georgie2” and even see a video the very first day we brought him home. We started following the vet’s direction and was feeding him pellet dog food, the same as the puppy dealer recommended. We were told it was premium quality but soon discovered he never really liked it or any other store-bought dog food we tried. I decided to try fresh food and started to feed him burgers from fresh ground turkey meat, scrambled eggs with some turkey bacon and other things we thought would be good for him. We have not increased the amount of meatloaf for years, so we know it has to be the treats and the lack of exercise, so we are committed to getting him back in shape. From this, I can no longer recommend any of these treats because there is no indication on their labels on the number of calories contained in each serving. Unlike human food, the law doesn’t require it, which it should. So you are in the dark as to the caloric intake your dog is getting and it becomes more of a challenge to weigh him regularly to watch his weight. It is a shame we had to find out after so many years and the FDA had to step in and formally make a ruling about these products. This also proves that we can no longer trust corporate America. They don’t always do what is right for us or for our dogs. We must try to feed our dogs wholesome food even if we have to make it ourselves. As I continued to search for the perfect food for Georgie I began to do some serious research. I study all the labels on some of the best dog foods from all the high-end dog food companies. I also spoke to a number of vets and did lots of research on the net and finally came up with my very own formula for healthy, fresh food. I created the Georgie Meatloaf you will see in this video. As you will see it is relatively easy to prepare and it will keep your beautiful doggies not only happy but healthy too. After eleven years of eating this Georgie meatloaf and he continues to be healthy in every way and in at his last visit to the vet, I was told he is perfect but could stand to lose a few pounds. The doctor told me he was a strong, stocky, solid, muscular, dog with a good coat, great disposition. So many other wonderful things about him that I knew. It was not only his genetics and our good care but the food he was eating. Our problem is not getting him enough exercise. Thinking of training him to get on our treadmill..
We no longer have to give him daily vitamins, no need to any special or exotic foods and he is just so full of fun and energy that we attribute some of this to the diet. If your dog tends to have a loose bowel movement, stomach problems, throws up, try my meatloaf and watch his problems disappear. When we have guest dogs staying with us or when we go to visit one of my sons who has two of his own dogs. We often give them some Georgie Meatloaf too and they all gobble it all up and as you will see in my video. Dogs will lick the plates clean and then search for any morsels that may have landed on the floor. Incidentally, there have been times when the meatloaf comes out of the oven that I have taken some for my dinner and after seasoning it for my tastes, I can tell you it is pretty good. I have been asked by friends and family to share my Georgie Meatloaf secret recipe with them and decided that I should really share it with everyone that loves their doggies, so please feel free to follow my directions, but remember, my recipe and this video is copyrighted and may not be used for commercial purposes without my written consent. Another informative article is on the AKC website offers even more options. Some viewers have stated that we should only feed our dog’s raw meat, others say we should only buy organic meat. Then there are those that want to spice up the meatloaf with garlic, onions and other spices. Many of these spices or veggies are on the do not use the list for dogs. Check carefully before you try to become more creative. Remember, you may like certain spices or food items, but you are not a dog. Some of these exotic ideas may work for some, but I have found no need to feed my little guy raw meat or organs, he is not a wolf in the wild. Maybe a German Shepard or other large and powerful dog might thrive on a raw meat diet, but could you even imagine feeding a small or even a medium sized dog this type of diet? I saw a video that showed one owner in his log cabin with a Bowie knife butchering a bunch of disgusting organs from various animals. As I said, different people have different concepts on what is right for their dogs. I for one can’t see myself even touching raw organs of other strange parts of animals, can you? As you can see from looking at all the testimonials from professionals and dog owners alike, Georgie Meatloaf is a great starting place for you to develop your own SAFE recipes for your dog. Just remember, if the ingredients are safe enough for your family to eat and not on the Not Good For Dogs list, then use them in your meatloaf. As seasons change we have the benefit of changing up the meatloaf as well. Now some viewers of my video have larger dogs that are 40-100 pounds and it would be impractical and expensive to feed them this recipe every day. I would suggest you use Georgie Meatloaf to supplement their diet. Try feeding them a couple of times a week as a treat. You can also mix in some of the meatloaves with their dry food as well. Experiment and based on your budget, try what you think will work for you and for your dog. Oatmeal. Because of the large amount of liquid from the produce, this tends to absorb some of it and retain the vitamins and nutrients in that liquid. Oatmeal is a good source of fiber and helps with bowel issues, it’s also safe for dogs with wheat allergies. This is also a good replacement for white rice. Pumpkin: Yup pumpkin is a great source of fiber and vitamin A. It’s also a helps if your dog has digestion problems. You can use raw or canned pumpkin in your Georgie Meatloaf. Also, consider these fruits…some dogs will eat anything others are fussy, but these are safe to feed them. It is hard to answer questions on YouTube because the same issues keep popping up and new viewers can’t see the answers because there are so many questions. So here are some answers and links to extensive articles about these concerns. Georgie Meatloaf provides everything your dog needs to stay healthy. Your dog probably doesn’t need added calcium, in fact, it can be harmful. Read this article. We’ve all heard about how microwave or cooking food removes some nutritional value but is it true? Is something bad happening to our food behind that microwave glass? The verdict: If you do it right, cooking food in the microwave is one of the best ways to retain your food’s vitamins and minerals. Find out more about Microwaving food here. Guess what? Microwave cooking does that. Cheese is a good source of protein for your dog. It also provides vitamins and minerals, such as calcium, Vitamin A, B-complex vitamins and essential fatty acids. A small piece of cheese can also provide the perfect camouflage for medications that your dog may need to take someday. It can be helpful to offer your dog occasional treats of cheese, but only if his body can handle it. Read more: Is It Safe for Dogs to Eat Cheese? KETCHUP, TOMATOES, HARMFUL FOODS: Many of my followers have commented on my use of Ketchup spread lightly on the top of the meatloaf or tomato sauce put into the meatloaf. There are many comments about Ketchup and the high fructose corn syrup in ketchup that is bad for the dog. The very small amount, a tablespoon or two on an entire meatloaf will not harm the dog. Most dogs love tomato sauce and at now we put some into the large batch to give it flavor. Although the green portion of a tomato is harmful, there is nothing wrong with the canned tomatoes. Do not use prepared Italian sauce, just the plain tomatoes. Use some of what is left for topping the meatloaf pans. This now replaces the ketchup we used in the past. Either one is fine, but since we now use the canned tomatoes as part of the main ingredients we use it for the top too. We continue to experiment with our recipe and I recommend you do the same. As long as the produce you put into the food is “dog” safe, try it. I hope this additional information will put these questions to rest. 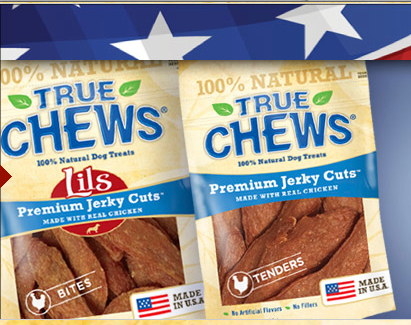 We supplemented his feeding with some made in the new TOP CHEWS USA made chicken jerky that we buy in a large bag at Costco, cost $19.99, but it will last many months. We take a scissor and cut half of one strip, which is enough for one day, into small pieces and stores it in a little plastic baggy. He loves it and will do all sorts of tricks for them and we know it is also full of protein and good for him, and it is made with Tyson chicken and other natural ingredients. We don’t have to be as concerned about this all American product and would never use any of the Chinese chicken or duck jerky we used to feed. I am waiting for reports that this product is also harmful to dogs too…it is just a matter of time. We have tried other treats from Costco as well and started to see Georgie gain some weight. So we are now cutting him down on these extras for the next couple of weeks. We will give him these treats sparingly to see if he can shed some of that weight. See how others have found Georgie Meatloaf a great way to feed their dogs…Here is one Facebook User who has her iPad playing my video as she prepares her own Georgie Meatloaf. Photo courtesy of Merle Gormick in Hawaii who makes Georgie Meatloaf for her four dogs. Well, I made it on yesterday and, on bated breath, I couldn’t anticipate enough if my Mon-Cheri would like it or not. She hadn’t been eating the dry food well enough since I obtained her last week and it had me worried. The previous owner had her on a totally “vegan” diet, and I introduced her to dry food, grain-free chicken food diet. Nevertheless, this morning cutting up slices of your recipe I made last night and smooshing it with the back of a fork and putting it into the microwave to heat it up a little bit, Mon-Cheri waited, ’cause she knew I was about to feed her and she was hungry. Previously, with the dry food, she’d go up to her bowl, smell it, take a few nibbles and then walk away from it. This morning she followed me underfoot to her eating area and when I placed her bowl down, she attacked it like no tomorrow! She LOVED, LOVED, LOVED it. Talk about devouring it as Georgie and Marley did; she licked her bowl and scrounged around the floor looking for more. Guess she didn’t know what good eating was until I presented this to her. And yes, I gave her a wee bit more and she devoured that too! I was so excited that she loved it so much. I am so happy and grateful to have come across your tutorial, ’cause I know she’s getting the best of the best and I followed your recipe to the letter with one exception, I omitted the bacon bits, and that’s only because she’s a little puppy and I don’t know how pork will affect her tummy. Perhaps I’ll give it to her when she’s a little older. In the meantime, I have prepared enough slices to last for 2 weeks. Thanks again for this wonderful recipe. I am SO pleased and relieved!! I think my fur baby is on the road to goodness! !